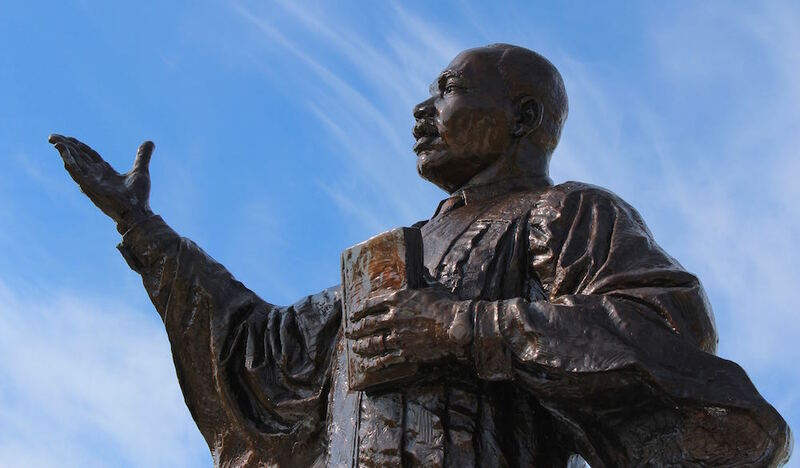 Thirty years ago a group of Black activists planted a tree to mark the place, on a median on MLK Blvd, where they wanted to install a statue of Martin Luther King. In 2012 the tree had to be removed when Metro, Houston’s transit authority, began construction on its light rail line. The director of the Black Heritage Society chained himself to the tree in protest, saying “The first train may run over my dead body.” Known as the Tree of Life, it was eventually relocated to MacGregor Park, and Metro paid $750,000 to create a memorial plaza near the tree. On one path that leads to the statue are quotes from King’s “I have a Dream” speech and the “Letter from Birmingham Jail.” The statue shows King in preacher’s robes, arm outstretched. On the intersection path is inlaid a chronology of his life. The video below, taken on the morning of its dedication in 2014, shows how people interact with the memorial plaza.